The drying time associated with applied finishes on a concrete slab is affected by a number of factors and can be shortened through the use of any or a combination of the following. Decrease the water:cement ratio of the concrete to between 0.40 and 0.45. Use a vapour retarder directly below and in contact with the concrete (ASTM E1745). Reduce the curing time (do not use a curing membrane). Protect the slab from environmental re-wetting. Increase temperature and reduce the RH of the drying environment. Avoid lightweight concrete aggregate mixes. The pH of the concrete needs to be checked for compatibility with adhesives used for applied finishes (Note: the concrete surface pH will increase after surface preparation). There is also a need to address the quantity of reinforcing steel in the concrete to overcome tolerance losses caused by normal drying shrinkage curling, which is increased through the use of an underside vapour retarder. 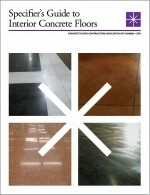 Further reading on this subject is available from ACI Committee 302.2R-06 “Guide for Concrete Slabs that Receive Moisture Sensitive Flooring Materials” and The Portland Cement Association “Concrete Floors and Moisture”.